Sefer Hapoal is the book in the series that is dedicated to grammar. It exists in two versions, the basic version and a more comprehensive version. The basic version (Sefer Hapoal B) is used with the beginner students whereas the more comprehensive version (Sefer Hapoal A) is used with those who are more advanced. 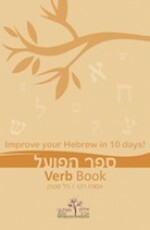 Sefer Hapoal introduces and explains the Hebrew verb system and demonstrates how verbs are generated in the Hebrew language. The purpose of the Grammar book is not to expand vocabulary but to learn and to understand the grammatical structure of the language. Students become familiar with, and subsequently practice, the different forms of the verbs whilst taking in to account the gender, number and tense of those verbs. This book gives an excellent foundation on which the Hebrew language can be built, and does so using a logical, easy to follow, systematic approach.